Electric baseboard heaters can unobtrusively add heat to a room that is chronically cold. 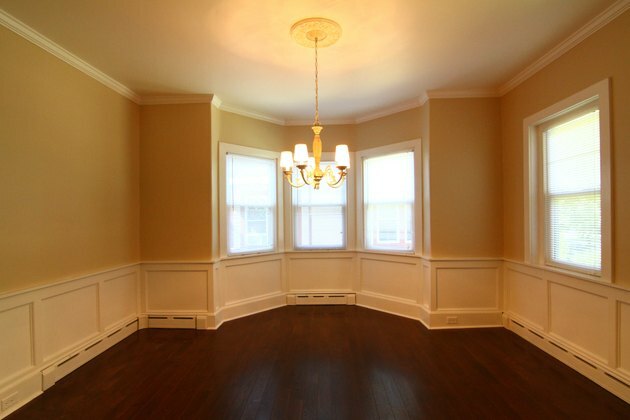 Except in mild climates where the need for heat is seasonal and occasional, and where a central forced-air heating unit and its associated ductwork would be excessive and unnecessary, electric baseboard heaters are generally considered too inefficient to supply the main heat for a residence. Electric baseboard heaters are best utilized to supplement the heat in a home, to compensate in areas where the central heating system is unable to adequately reach, or to selectively heat one room or area. Employed strategically, the use of baseboard heaters can actually lower energy costs. 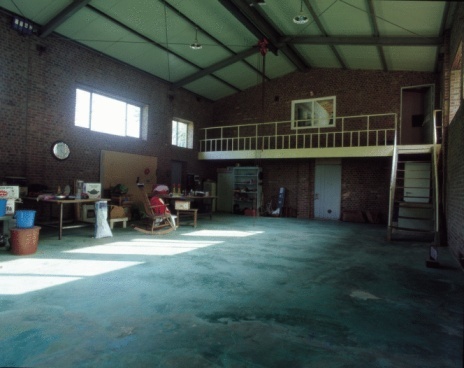 Convection circulates best when the heater is placed on an outside wall under a window. There are two basic types of electric baseboard heaters: electric convection and electric hydronic, and within those broad categories are numerous variants. All of the baseboard heaters are long and narrow, encased in metal painted beige or gray or cream or some other suitably neutral color, and are designed to hug the wall at the baseboard. A few models of baseboard heaters come equipped with a fan to assist in air circulation, but most—both electric and hydronic alike—rely on convection for their circulation system. Convection is based on the principle that cold air falls and hot air rises. The heaters are designed to receive colder air at the bottom, to pass it through the heating coils and to release it out the front, where it rises to fill the room. That's why it is generally recommended that baseboard heaters be placed against an exterior wall and below a window or bank of windows. The cooler air descending from the surface of the glass panes energizes the convection effect and promotes circulation of the heated air. A typical portable electric baseboard heater—corded, and with a built-in thermostatic control. Both electric convection heaters and electric hydronic heaters are available as portable units that are corded and plugged into a standard 120-volt, 20-amp outlet, and as hard-wired units that require either 120 or 240 volts. For optimum efficiency, the 240-volt hard-wired baseboard heaters are the best choice. 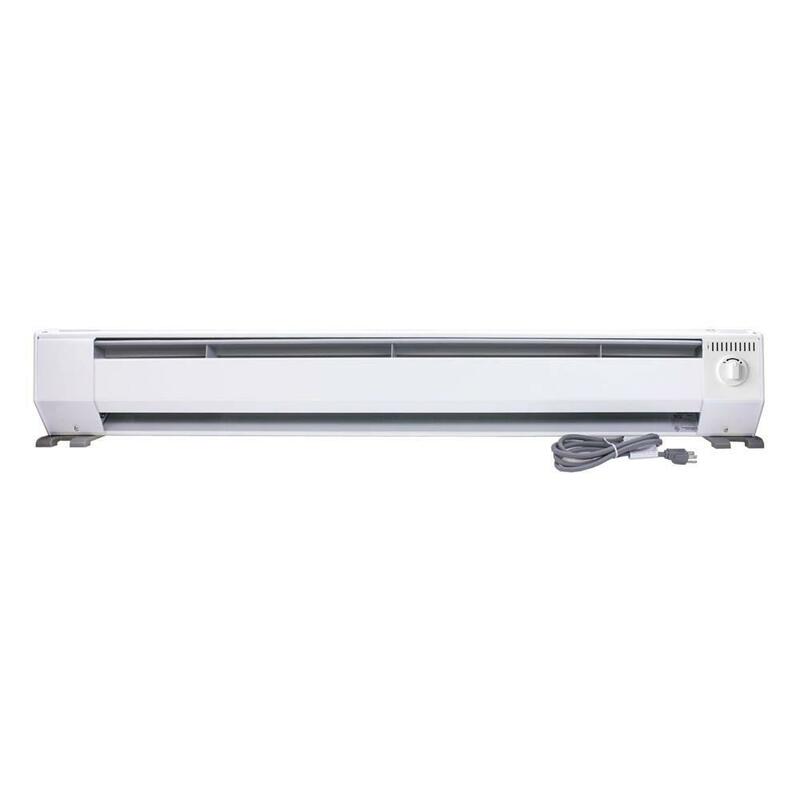 Baseboard heaters are available in a range of lengths and wattages. For best results, the heater you choose should be adequate to the dimensions of the room it will heat. To determine the appropriate baseboard heater size, multiply the length times the width of your room to determine the square footage. Each square foot of your room requires approximately ten watts of heater capacity, so multiply the number of square feet by ten to determine the watt output of the heater your room will require. Most electric baseboard heaters will specify their wattage; you can also estimate the wattage of a 240-volt heater by assuming 250 watts for each foot of heater. Some baseboard heaters come equipped with a built-in thermostat and some require a separate thermostat to be added. Some can even be wired into the home's central thermostat. If your intent is to correct uneven temperatures, connecting a baseboard heater to the central thermostat will fail to solve the problem since doing so will cause the baseboard heater to shut off along with the central heating. The integral thermostat, if your unit has one, is second best, since it can be influenced by hot or cool air currents in the immediate vicinity of the heater and not necessarily the overall temperature of the room. The most accurate means of control is a dedicated thermostat located on an interior wall. Typically, this requires a line voltage thermostat. Unlike the familiar low-voltage central thermostats that work indirectly to control your heating system, line voltage thermostats are wired directly into the power supply for your heater and allow or interrupt the power flow as needed. They are therefore only appropriate for hard-wired baseboard heaters, which are usually 240-volt units. These thermostats are not practical for 120-volt plug-in heaters. Electric convection and electric hydronic baseboard heaters look basically the same. The differences lie in their initial cost and in their overall effectiveness. Convection baseboard heaters are simply a high-resistance heating coil surrounded by fins or baffles that maximize the surface area that gets heated. Cool air enters the heater, is warmed as it is drawn through the fin structure and leaves the unit as warmed air. Convection heaters are generally the least expensive to purchase. The units that don't rely on a fan are quiet, mechanically uncomplicated and reliable. They heat up quickly and, when shut off, shed their warmth just as quickly. Their inability to retain residual heat makes them the less efficient and ultimately less economical choice. 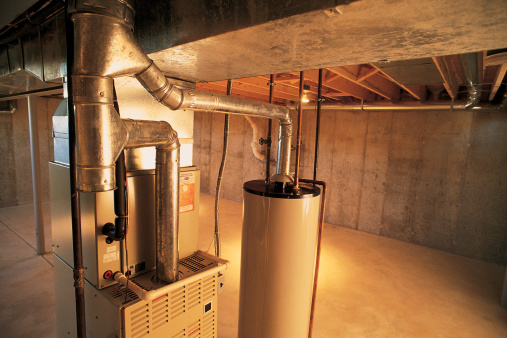 Electric hydronic heaters first warm the liquid in a central tube, then the heated liquid warms the surrounding air. Hydronic baseboard heaters use electric heating coils or rods to warm a chamber filled with water, oil, or some other special heat-transfer fluid. This makes them slower to reach full temperature, but once the target temperature is reached, the heated liquid holds and radiates that warmth long after the power is off. Hydronic baseboard heaters are generally more expensive to purchase than simple convection ones—often four to five times as expensive—but their operating economy soon makes up the difference. 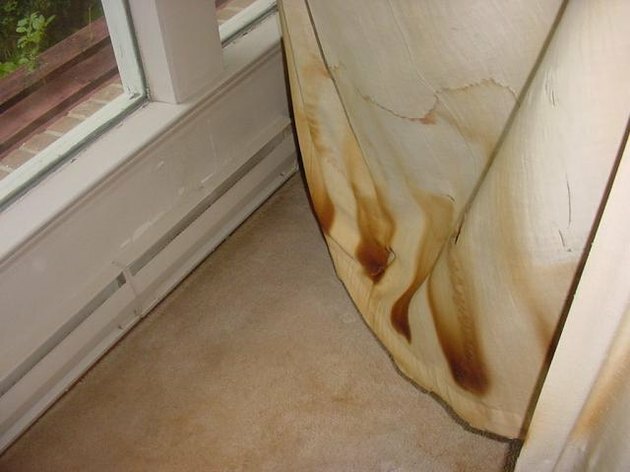 credit: Image © Buss Inspection Services, Inc.
Draperies that come in contact with or in close proximity to electric baseboard heaters can ignite unless the unit is equipped with a thermal shutoff. 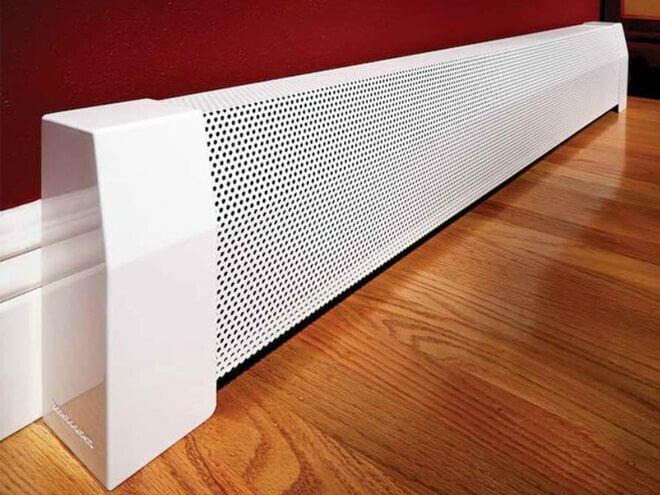 Baseboard heaters work best when there is a free flow of air above and around them. That means they will dominate a wall—furniture and draperies placed in front can interfere with their function and even present a fire hazard. Although most baseboard heaters are designed to be safe to touch, something falling onto a heater or draping over it can cause the unit to overheat. To prevent overheating, many models are equipped with a safety thermal shutoff that will respond by turning off the heater. Of course, the presence of these heaters at baseboard level presents a potential hazard to small children, so take that into consideration, as well. Covers can be added to dress up, somewhat, the utilitarian appearance of baseboard heaters and also to make them less accessible to children. In a dust-prone house or one with pet hair issues, you'll need to clean and vacuum your baseboard heaters regularly, as dust and pet hair scorched by the heating element can produce unwelcome odors and also inhibit the effectiveness of the heater. Mounting the baseboard heater on the wall is the easy part. A few screws, possibly some drywall anchors, and you have it. The tricky part comes with the electrical connections. Even a simple portable, corded, 120-volt heater merits some advance consideration. Unless it's one of the smallest units, the heater should be plugged into a 20-amp circuit; in many homes, those can be in short supply. You need also to consider what else shares that circuit. It doesn't take many high-wattage appliances to trip the breaker. The 120-volt baseboard heaters are also considered the least efficient. Effective baseboard heaters require a 240-volt, 20-amp circuit—probably a separate dedicated circuit for each room you heat—and that circuit ideally should include a line-voltage thermostat. The electrical complexity, including whether you have adequate electrical capacity in your home to accommodate electrical baseboard heaters, argues strongly in favor of a consultation with a qualified electrician. This is especially true if you plan to add several heaters. A licensed electrician can tell you if the power supply to your house is suitable and whether you need additional circuits. If you do, he or she can safely and properly install them.